The byline on Ikspiari is that it is "a new 'town' filled with stories and entertainment." A less exotic (and perhaps more accurate) description would be "upscale shopping mall with restaurants and a multiplex." Ikspiari (pronounced something like "experience" with the "ence" left off the end) opened in the summer of 2000 as part of Tokyo Disneyland's expansion from a single theme park to a full-fledged resort. Because it's part of a Disney resort, you can expect liberal doses of Disney magic, with beautiful scenery, quality everywhere, and extreme attention to detail. Ikspiari is not Disney-themed in the traditional sense however; although there is one of the largest Disney Stores in the world, this is about the only sign of Disney you'll find. That means when you're shopping for that 5,000,000 yen diamond necklace at Tiffany's you don't have to worry about Goofy sneaking up from behind to surprise you. The variety of shops and eateries is what you might expect from a posh shopping mall. There are about 120 shops and restaurants including Mikimoto International, Godiva Chocolatier, a Planet Hollywood and a Rainforest Café. There are some neat specialty stores too, like a shop that sells model trains and another that sells seriously expensive kaleidoscopes. There is a children's play area called "Camp Nepos," and a 16-screen multiplex. A movie ticket will set you back about $20, typical for Japan. By any measure, Ikspiari is a beautiful and opulent shopping mall. The question is, should you spend time there on your trip to Tokyo Disney Resort? The answer is: maybe not. Japan—Tokyo in particular—is a land of consumers; that means there's a lot of great shopping to be found just about everywhere you go. If you want to visit a Japanese shopping mall you will never forget, Odaiba is about a 30 minute train/subway ride from the Resort. The Tokyo area has some famous shopping "towns" as well. There's Akihabara, the "electronics town," Ginza, an upscale shopping town a la Beverly Hills, and Asakusa, the place to go for traditional Japanese goods and souvenirs. Ikspiari is separate from the Parks so you don't have to worry about purchasing a ticket to get in. It is located just a short walk from Maihama train station. As mentioned above, Ikspiari is not Disney themed; that means it does not sell Tokyo Disney Resort merchandise. If you want to buy Resort souvenirs but are not visiting the Parks, you should go over to Bon Voyage which is next to Maihama train station and a short walk from Ikspiari. 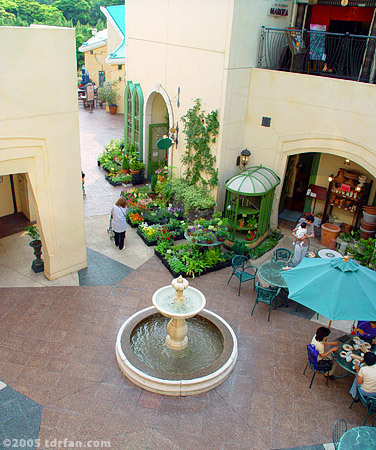 Ikspiari is a beautiful place and a wonderful shopping experience. However, wonderful shopping experiences are not hard to find in Japan. If you're at the resort and have some time to kill but don't want to hop on a train and venture out in to Tokyo, then by all means pay a visit to Ikspiari. You might also want to visit Ikspiari if you're spending the day at one of the Parks but want to get away for a quiet dinner in a nice restaurant. The Resort monorail system has a station right at Ikspiari, which means convenient access from anywhere at the Resort.